The first part of seventh grade was rough on Jed, but things are looking up now that Christmas is almost here. As with past Christmases, Jed asks for the one thing he's always wanted--a dog--and again, his parents tell him they're not ready. But fate has a different plan when Jed sees a dog get run over by a car. Then, it happens. Jed suddenly has a pet, Tread, a zombie dog bearing his namesake--a tire tread down his back. 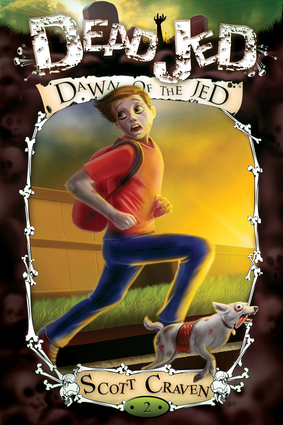 Jed may have gained a dog, but he loses his best friend Luke, who fears the way Jed created his undead pet.When Jed returns to school, he finds a mysterious group called the No Zombies Now Network spreading rumors of the dangers the undead pose to normal people. Forced to disprove Hollywood stereotypes, Jed has his work cut out for him as stories of a zombie dog begin to circulate. Jed could be expelled if he can't expose the NZN Network as a fraud. Jed needs help from his kind of girlfriend Anna, especially after he discovers Luke has joined the shadowy group.Once again navigating the treacherous waters of middle school, Jed does his best to stay in one piece. Only this time he'll need even more duct tape and staples than usual. Scott Craven is a seasoned journalist, storyteller, and a features writer for The Arizona Republic. He lives in Phoenix.